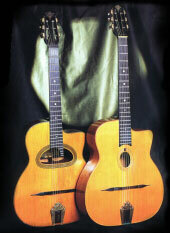 The luthier François Charle was born in Paris in 1949. He is an authority on Classical, Traditional and Modern French stringed instruments. In 1979 he and his wife Rosyne took over from Daniel and François Sinier de Ridder the instrument shop and workshop in the Galerie Véro-Dodat, an historic arcade in the center of Paris. 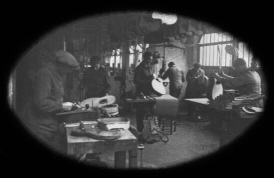 His liking for Selmer-Maccaferri guitars took a decisive turn when he had the opportunity to buy the tooling stock of woods and spare parts of the old Selmer workshop. 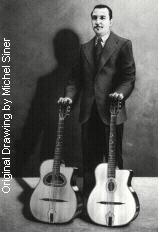 He became fascinated by the somewhat hazy history behind this guitar and the myth that is represented. So he threw himself into a ten year long research project, using archeological type methods to unearth all the available information on these mythical guitars. 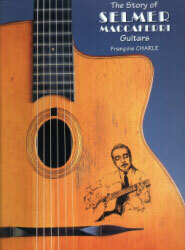 This book is much more than a compilation of the results of this inquiry into "Django Reinhardt's guitar", it is a real plunge into a world whose inhabitants have a passion for instrument making and music. At the Samois festival in June 99, I had the honor of meeting this remarkable man whose unstinting efforts have culminated in this truly fantastic creation. Because of the limited imagination of various publishers, François Charle has had to pay for the preparation, photography, layout, printing, binding, production and selling of this limited edition of 2000 copies, available in English as well as French, a remarkable feat, helped by friends and supporters who paid in advance for their precious copy, whose names can be found in the back of this tombe.